He may still be technically "little," but make no mistake: your kid definitely has what it takes to walk among giants. And run, and tackle, and score touchdowns among giants... or, shall we say, the New York Giants. He wouldn't have it any other way, because his team is, always has been, and always will be the Big Blue. Luckily, we have a way for your football star in training to realize his ambitions and become one of the guys he looks up to (if only for one night; we're thinking Halloween might work). So let him know he's been picked for the team and have him suit up in this Child NFL New York Giants Helmet and Jersey Set! Officially licensed by the NFL, this awesome uniform bears the iconic markings and colors of the team with the third-most NFL titles in league history. 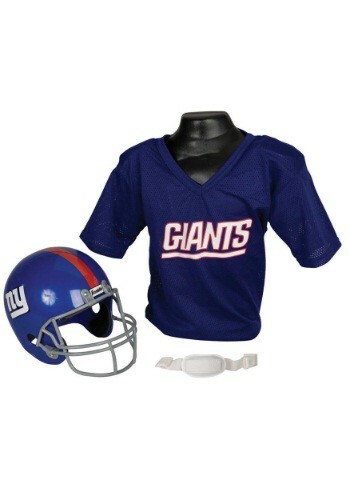 The costume set includes the Giants jersey, the helmet (as if we'd forget! ), and an adjustable elastic chin strap to hold it in place once your athlete hits the field. The suit goes great with a pair of classic football pants or a pair of sweats, and is perfect for all kinds of occasions, like Halloween, or your next viewing party for the New York Giants! Just don't forget to have a look around at other football accessories (like eye black and shoulder pads), so when the time comes, your future star will be ready for his big trip to MetLife Stadium!